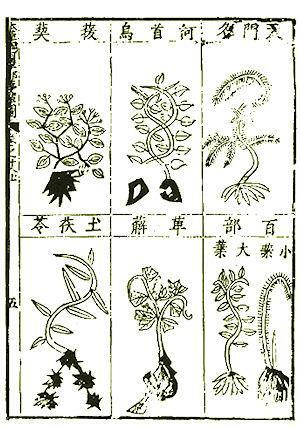 China's traditional medicine goes back thousands of years. 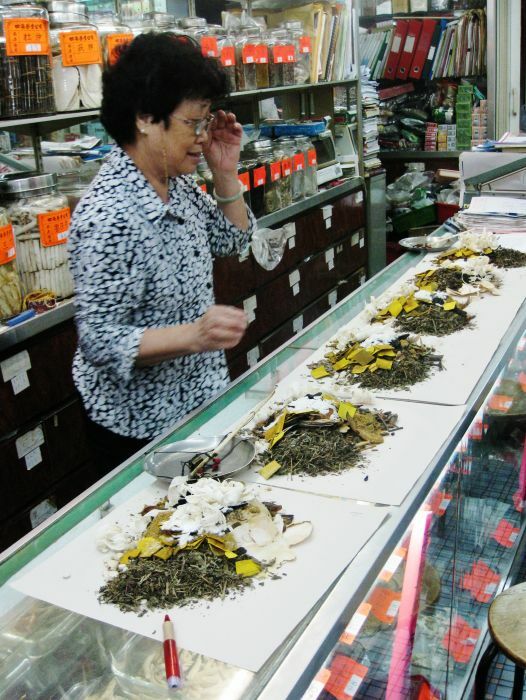 Unlike the situation in Europe traditional medicine in China is still practiced alongside modern scientific medicine. Since the opening up of China the traditional approach to healthy living has been appreciated in many other countries. Traditional Chinese Medicine (T.C.M.) is made up of many strands including acupuncture; herbal medicine and moxibustion. The approach is holistic, treating the body as a whole, rather than concentrating on a particular symptom or organ. A schematic of the 'Chinese' or human body meridians. The Chinese meridians are used in various oriental fight styles, as well as in healthcare; e.g. in traditional herbal medicine, massage techniques (see pressure points ➚), ... The schematic was based on an image of the Northern Crane Martial Arts Association dojo. Permission was given for the use of the image at wikimedia commons by sensei Phil Perez. Image by KVDP ➚ available under a Creative Commons license ➚. From ancient times it had been discovered that applying pressure to nerves can ameliorate pain. Over the centuries acupuncture points were mapped out over the whole body. Each point on the body has specific effects not necessarily at the place where the acupuncture needle is inserted. The acupuncture points are associated with channels that carry qi around the body. Illnesses are supposed to arise because there is a poor or blocked flow of qi and associated with an imbalance of yin and yang. There are six meridians (jing) on either side of the body with one down the middle of the back and front. Seven channels have a ‘yin’ association and seven ‘yang’. 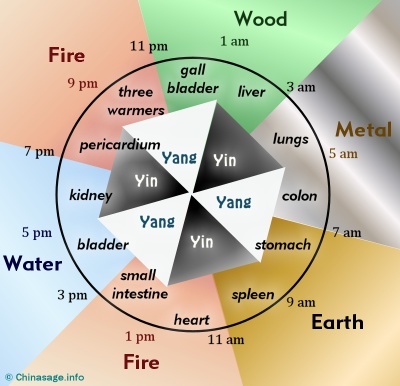 These acupuncture channels can be used to control yin and yang in complex ways. By the time of the Song dynasty teaching of the needle points had reached the sophistication of using a bronze figure with over 600 points drilled into it. The figure was covered in wax and filled with water. When the student inserted the needle correctly a jet of water would flow out. Acupuncture can be used to block nerve impulses and so provide a local anesthetic effect. Some practitioners are able to achieve anesthesia with the pressure of fingers alone. Patient has skin reddened by use of cupping, after this acupuncture needles have been added. Moxa was then put on the end of the needles and set alight. Image available under a Creative Commons license ➚. In moxibustion, dried Artemesia (Mugwort) 艾 ài leaves are burnt to heat an acupuncture needle after it has been inserted or alternatively the Moxa is burnt directly on the skin to cauterize it and form a blister. Mugwort is chosen because it contains substances that help to stop bleeding. Cupping is a technique that is also used, a jar is filled with heated air and then sealed tight against the skin. The cooling air causes the skin to be forced up into the cup. It is supposed to work by drawing diseases out of the body. A similar technique was used in medieval Europe ➚. Traditional medicine at a market including snakes; fungi and tortoise. Image by Vberger ➚ available under a Creative Commons license ➚. By tradition, the study of medicine goes back to the legendary founder of China: the Yellow Emperor Huangdi. ‘The Inner Canon of Huangdi’ Neijing 黄帝内经 is attributed to him and describes traditional medicine in great depth. It was developed and refined over the centuries. By the end of the Han dynasty over 400 diseases had been identified with designated treatments. As with all ancient medicine the taking of the processed (mainly plant) material was associated with a degree of magic and incantation. Doctors were divided into three classes, the Imperial doctors who were employed by the court and received a salary; scholars who studied medicine as a sideline helping friends and colleagues on an ad hoc basis, and finally, untrained doctors who treated the masses. Doctors would concoct their own 'cures' and keep the recipe as a closely guarded family secret. The same cure would be offered by descendents hundreds of years later when the stories of efficacy had spread around. By the Tang dynasty an Imperial Institute of Physicians was setup, the first medical school in the World. In 1111CE a medical encyclopedia was published by Imperial decree. It described how a wide variety of plants could be used for pharmaceutical purposes. At one stage it is said that doctors were paid in a strangely inverted insurance scheme - the doctors only received a payment if the insured remained well so there was a strong incentive for precautionary care. Buddhist monks from India brought medical knowledge to China and detailed books on anatomy were produced. The key medical work for centuries was the Bencao Gangmu ➚ 本草纲目 (Encyclopedia of Plants and Roots) which has its origin two thousand years ago and was extensively updated in Ming dynasty times. It comprises 52 volumes and 2,000,000 characters. The first European input to Chinese medicine was brought by the Jesuits in the 16th century, they prescribed quinine for treating malaria and antimony for parasitic infections. In the period 1849-1900 many Westerners came to appreciate TCM in California; it was Chinese medicine that helped keep all the miners who flooded into the U.S. healthy. It took some time for them to accept non-Chinese medicine. Surgery was little practiced in China as there was a strong belief that the whole body should be kept intact and no part should ever be removed. This stems from the holistic belief that a person is healthy when all parts are in balance and harmony. So in historical times, surgery only dealt with external diseases and conditions: skin; fractures; wounds and haemorrhoids. In fact before the use of heavy machinery and petrol engines there were relatively few injuries severe enough to require surgery. A page from the ‘Compendium of Materia Medica’ (本草纲目 Běncǎo Gāngmù is a pharmaceutical text written by Li Shizhen 1518-1593CE. Image available under a Creative Commons license ➚. The Chinese incorporated medicine within the proto-scientific regime of elements; qi and yin-yang. Body organs are associated with particular elements. Foods also have elemental associations and medication seek to restore a balance, so, for example, if someone is feverish then a medicine or food with a cold association is used. The doctrine of yin-yang goes back to the Huangdi's influential Neijing, here it is explained that 'yang' represents outside; back; hot; hollow organs and dark; while 'yin' represents inside; front; cold; solid organs and light. So a pain in the front suggests an imbalance of yin and would be treated with yang substances to correct it. All foods and medicines were categorized on their strength of yin or yang (see our food page for a list). The five elemental essences of fire; water; metal; wood and earth are associated with specific colors; organs and substances. They have to be kept in balance to achieve overall health. The elements have a creative and destructive cycle so that an excess of one element can be counter-acted by taking a substance of the appropriate destructive element. So as fire destroys wood, an illness associated with the wood element is treated by taking a medicine rich in fire (e.g. peppers). Each element has an associated time of day and a season so the treatments can vary with time and day. 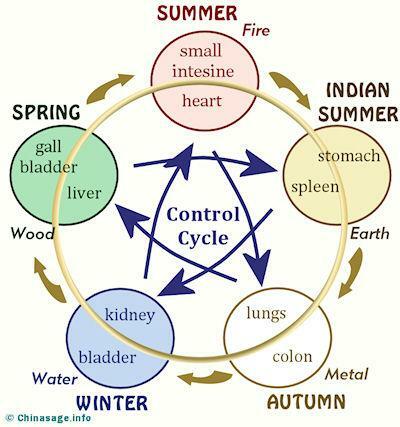 The annual cycle of elements as they affect the body. Most medicines are mixtures of roots; bark; fungi and leaves, sometimes with ground up animal parts (snakes; fish; toads etc.). Some of the more exotic ingredients are sea horses for childbirth; scarab beetles for polyps; piles and dysentery; carp for coughs and asthma; hornet's nest for poisons; berberis for stomach pain; frogs for boils; centipede for snakebites, malaria and reindeer antler for impotence. Usually boiling water is added to the mixture and the infusion is then drunk as a 'tea'. The daily cycle of elements as they affect the body. The use of tiger; sea horse, elephant ivory, rhinoceros and other endangered species in medicines continues to cause concern as the high price of these animal parts has promoted illegal trade. Rhinoceros 犀牛 xī niú horn was particularly valued as a medicine, it was also used for making drinking cups. Only a few body parts are used from these animals in TCM and there is no proven efficacy. Tiger bone, for instance, was supposed to help with arthritis; the belief was based on the false premise that tigers were never seen to limp. Dadaocheng store, Taipei, Taiwan, now 100 years old, has a fine selection of Chinese medicines. Image by 都市酵母 ➚ available under a Creative Commons license ➚. The massive Bencao Gangmu encyclopedia lists 1,892 drugs of which 1,094 have plant origin, 444 animal and 354 mineral. Of these many would have little or no effect, and a few made the patient worse (for example mercury and sulfur) while others are now known to have been efficacious (Omphalia lapidescens ➚ for tape worm; Kaolin for diarrhea; Dichroa febrifuga for fevers; Ephedra sinica for asthma). A good example of such a health product are goji ➚ or wolfberries which are now eaten as a healthy food worldwide; the berries were traditionally used for treating high blood pressure and fever. Ginseng ➚ (Reshen 人参) is another traditional medicine extolled as a health food. Ginseng is an example of a plant that came into use because the shape of its roots look like the body of a person. The traditions and medicines must be put in the context of World medicine. Most cultures developed herbal remedies in the same ad hoc way. Villages in medieval England would have had a herbalist well versed in use of herbs to cure ills. Many cures were based on similarity of appearance (Doctrine of Signatures ➚), for example the markings of the leaves of lungwort ➚ look like lungs and so it was assumed it must therefore be good for curing lung ailments. Plants with fruits shaped like kidneys must be good for the kidneys and so on (the doctrine of signatures ➚). In many instances it was impossible to prove if a treatment was effective as there is no 'control' to compare with – the patient may well have got better anyway. The placebo effect is also very strong, a practitioner who is supremely confidant of the efficacy of the medicine undoubtedly influences the mindset of the patient. Some treatments were definitely staged for effect, Lu Xun writes of a supposed cure for tuberculosis that entailed eating bread soaked in the blood of an executed criminal. Dispensing traditional medicine prescriptions. Graham Street Market, Hong Kong. 2010 Image by deror_avi ➚ available under a Creative Commons license ➚. A traditional diagnosis is a thorough process, the doctor listens carefully to the patient. Particular attention is paid to the tongue and complexion. The acupuncture channels are felt and the pulse measured on both the left and right sides. Measuring the pulse accurately may take up to half an hour. The diagnosis follows rules to determine the problem, always seeking where a yin-yang imbalance may be located. As it is a holistic approach the treatment is not just the taking of a medicine; it also involves diet; massage; breathing and exercise. There are records of variolation ➚ as long ago as the Song dynasty, patients were exposed to smallpox ➚ for a short time and this provided immunity from later infection. The method was to inhale the contents of dried infected pustules. In the Ming dynasty this form of vaccination became widespread as smallpox was a serious condition affecting the majority of people in China. Bearing smallpox pockmarks was seen for centuries as a badge of reaching maturity. When China rejected Western science in the Cultural Revolution the position of medicine proved a thorny issue. Mao Zedong much admired the work of Norman Bethune ➚ a Canadian who worked with the wounded Communists troops and did much to demonstrate the superiority of Western Medicine. At the time there were very few Western trained doctors in China so a twin track approach was adopted of Western medicine in cities and a system of bare-foot doctors using a mixture of traditional and Western techniques in rural areas. TCM was one of the few traditions that was protected during the Cultural Revolution when most 'old' customs were denigrated and abandoned. Mao used the maxim It is better to walk on two legs than one to justify the use of western medicine alongside traditional medicine. By collecting together all traditional remedies used over the whole country it was possible for the government to filter out good from bad medicines. It was also the case that there was no money to roll out Western medicine to the whole country at the time. Traditional Chinese Medicine is still used for minor ailments and when modern medicine fails to provide answers, for example, chronic pain. Citation information for this page : Chinasage, 'Traditional Chinese Medicine', last updated 28 Nov 2016, Web, http://www.chinasage.info/medicine.htm.